Stuart Bruce Greenwood (born August 12, 1956) is a Canadian actor and producer. He is known for his roles as the American president in Thirteen Days, National Treasure: Book of Secrets and Kingsman: The Golden Circle and for his role as Captain Christopher Pike in J. J. Abrams's Star Trek reboot series. In television, Greenwood starred as Gil Garcetti in The People v. O. J. Simpson: American Crime Story, and has appeared in Mad Men, St. Elsewhere, Knots Landing, and John from Cincinnati. He currently stars as Dr. Randolph Bell in the medical drama The Resident. He has appeared in supporting roles in such films as Hollywood Homicide, Double Jeopardy, Déjà Vu, I, Robot, Dinner for Schmucks, Capote, The Post and as the motion-capture alien dubbed "Cooper" in Super 8. Greenwood is also a voice actor; his voice roles include Chiron in the Canadian animated series Class of the Titans and Bruce Wayne / Batman in Batman: Under the Red Hood, Young Justice and Batman: Gotham by Gaslight. Greenwood is known in the United States for his appearances in Star Trek; I, Robot; Double Jeopardy; The Core; Thirteen Days, (in which he played president John F. Kennedy); Capote, (in which he played Jack Dunphy, Truman Capote's lover); Eight Below, (in which he played Professor Davis McClaren); and Firehouse Dog. He is also known for his role in the video game Call of Duty: Modern Warfare 3 as the voice of Overlord. He had prominent roles in the award-winning Atom Egoyan films Exotica, The Sweet Hereafter, and Ararat. He appeared in the 1980s teen cult film The Malibu Bikini Shop and starred in Mee-Shee: The Water Giant. He played a role in The World's Fastest Indian and also featured in the Bob Dylan biographical film I'm Not There. He appeared in Dinner for Schmucks as the cruel executive who hosts a dinner for "idiots". On television, Greenwood had roles on St. Elsewhere (Dr. Seth Griffin, 1986–88), Knots Landing (Pierce Lawton, 1991–92), and a starring role in the UPN series Nowhere Man (Thomas Veil, 1995–96). He also guest starred on the popular Canadian show Road to Avonlea for one episode. He won a Gemini Award for this role as "Best Guest Performance in a Series by an Actor". On June 10, 2007, HBO's John from Cincinnati premiered, starring Greenwood. Greenwood also appears as the President of the United States in National Treasure: Book of Secrets. He played the Beach Boys drummer, Dennis Wilson, in Summer Dreams: Story of the Beach Boys. In 2009, he worked with Australian director Bruce Beresford, playing the part of Ben Stevenson (artistic director of Houston Ballet), in the critically acclaimed film Mao's Last Dancer. Greenwood voiced Bruce Wayne / Batman in the animated film Batman: Under the Red Hood and in Young Justice. Greenwood played the lead role in the horror thriller Cell 213. He is the lead for the Steven Spielberg produced 2012 ABC series The River and reprised his role as Admiral Christopher Pike for J. J. Abrams' Star Trek Into Darkness. In 2015, Greenwood had a recurring role in the last season of Mad Men as Richard Burghoff, a romantic interest for Joan Harris (Christina Hendricks). Stuart Bruce Greenwood was born in Noranda, Quebec, the son of Mary Sylvia (née Ledingham), a nurse who worked in an extended care unit, and Hugh John Greenwood, a Vancouver-born geophysicist and professor who taught at Princeton University. He is married to Susan Devlin and lives in British Columbia. 1987 Matlock Mitchel Gordon Episode: "The Billionaire"
1987 Jake and the Fatman Carson Warfield Episode: "Fatal Attraction"
2015 Wet Hot American Summer: First Day of Camp Bill Martinson Episode: "Electro/City"
2016 American Dad! Navy Captain (voice) Episode: "Daesong Heavy Industries II: Return to Innocence"
^ Fitzpatrick, Kevin (2010-07-23). "Comic-Con 2010: Young Justice Goes Under Cover". UGO Networks. Archived from the original on 2010-07-26. Retrieved 2010-07-23. ^ "Freestyle Releasing Locks Down 'Cell 213'". bloody-disgusting.com. ^ "Trailer Debut for IFC Midnight's 'Cell 211' -". bloody-disgusting.com. 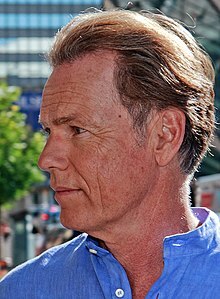 ^ a b "Bruce Greenwood profile". filmreference.com. Retrieved September 28, 2015.